We went shopping for candy in Seattle. Our son and daughter wanted to pick out a couple sweet pieces for dessert. I didn't want candy, because I had eyed a chocolate covered strawberry, and that was perfect for me. So, we made our way to the chocolate store, and my husband asked for the strawberry. 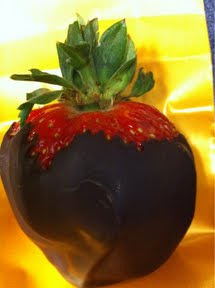 The lady gently guided a beautiful chocolate strawberry out of the case and put it in a golden bag. She handed me the bag, then walked to the register and rang it up. "Seven dollars, please" I smirked, and quickly looked the other way. My husband looked at me in shock, pulled out his wallet and reluctantly handed over seven dollars! "Well, that better be one good strawberry" he said, as we left the store. "Oh, it will be!" I chuckled. I had no idea that strawberry was seven dollars! And, if I had known ahead of time, I wouldn't have wanted it. But, I certainly don't regret buying it, because it was worth the look on my husbands face. It wasn't very good planning on our part though. And, as often the case, poor planning gets me in a disaster in one way or another. All I can say is this: I am so very thankful I have a God that knows the plan! He watches out for me, takes care of me, He is the sweetness in my life. Sometimes my poor planning is costly, but always, He is there to walk beside me. Say that Again, Jesus, You are there to walk beside me, everyday. I just love that!